During the last half of the 19th century, there was much immigration to the western United States. People came for many different reasons. Some were forced to immigrate. For example, the Mormons came to the West to seek religious freedom. Others immigrated to improve their lives. The Gold Rush lured many people to California. How do you think the journeys of the immigrants differed? What were their experiences on the road and at their final destinations? What caused them to move in the first place? In order to find out the answers to these questions, we will look at firsthand documents (diaries, journal, books) written by immigrants during the late 1800's. View a PowerPoint presentation on Westward immigration. The PowerPoint presentation in the hook will guide the students as far as what type of questions they ask. The presentation is comprised of different journal entries documenting the experiences of different immigrants. Students will compare and contrast these entries and will come up with questions about the experiences of the immigrants. If the students are struggling to come up with questions or get on a different topic, the teacher may want to use the following questions to guide the class. Do you think it was worth the trip for those who traveled to California, despite the hardships they endured along the way? 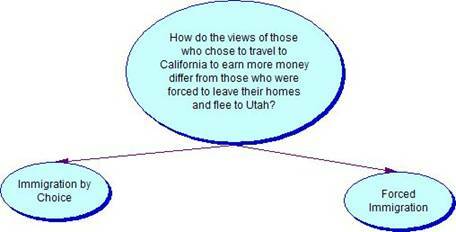 How did the views of those who traveled to California to earn more money differ from those who were forced to leave their homes and flee to Utah? How do the points of view of those who wrote the journal entries differ depending on their ages and genders? Online primary sources from the digital resource collection American Memory will be used. immigration - Movement from one place to another. immigrants - The people that move from one place to another. The primary sources are from the 19th century and students may encounter unfamiliar words that are no longer used today. The students may ask the teacher, if necessary, for definition. The students will use Inspiration to create concept maps related to the question the students asked. The students will also use Microsoft Word to write about their findings. The students will compare and contrast the journal entries and other documents written by immigrants in the 19th century. They will organize this information in a concept map. The concept map will grow and become more complex as the student gathers more information related to their question. They will put their concepts into word by writing a document in Microsoft Word. California As I Saw It - The site contains books written by immigrants to California during the years of 1849 - 1900. Trails of Hope - This site has diaries and letters from 1846 - 1869, written by immigrants to Utah, Montana and the Pacific. 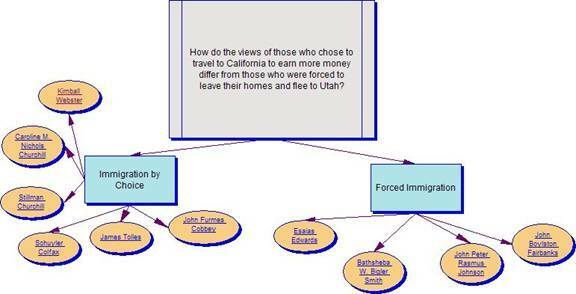 Students will analyze the data/information by creating a concept map with Inspiration. The students will pick a question related to westward immigration in the late 1800s (either a question from the hook or one they came up with on their own). This question will be the main idea of their concept map. Then the students will answer the question by researching the online collections given. Evidence for the question will be put on the concept map. Then the students will organize the results. The students will clean up the concept map and add graphics if desired. The last step is to write a Word document, answering the question. The views of those who chose to travel to California to earn more money differed from those who were forced to leave their homes and flee to Utah. They had very different experiences as they traveled, which resulted in different viewpoints of immigration to the West. Those who chose to leave tended to look upon it as a positive experience, while those who were forced seemed happy where they ended up but seemed to face more hardships on the way, due in part to a lack of resources, preparation time for the journey, and lower socioeconomic status. Many of the immigrants who moved to find religious freedom ultimately did so, whereas many of those who traveled to California to find riches did not. 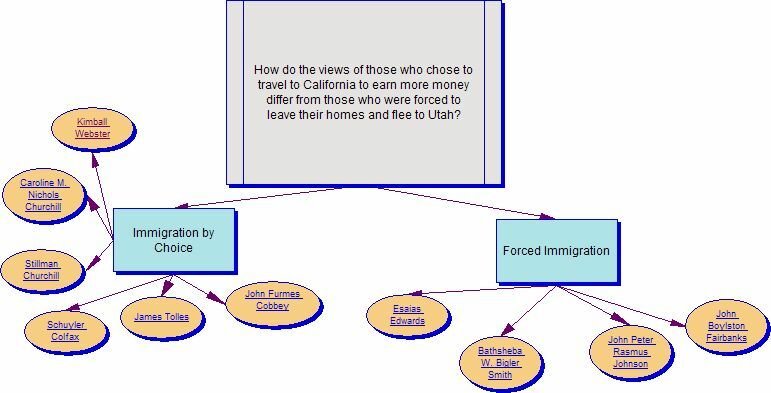 How did the views of those who immigrated to California to earn more money differ from those who fled to Utah to have religious freedom? The final part of the project is for the student groups to present their findings to the other groups in the class. There are no clear cut answers to the questions. The questions are meant to be fairly open-ended. Students will present their findings in a convincing manner by giving examples from the primary sources to back up their conclusions. What are some reasons people immigrate to the western United States today? Would the reasons be similar or different than the reasons stated in the firsthand accounts we read? What other migrations occurred in United States history? Were they forced or voluntary immigration? What are the stories behind other immigrants in U.S. history?